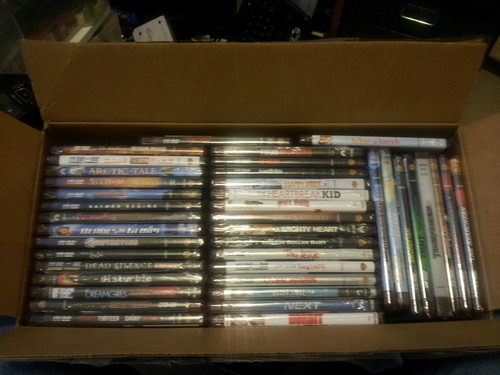 So I bought a box of 40 HD-DVD movies on Ebay last week and they jusy arrives. What is HD-DVD? It was the format that lost out to Blu-Ray. Same resolution, different incompatible format (remember the Bets vs. VHS video casstte war? This is the Beta of high definition formats). This is a dead format. Why would I buy them if it’s a dead format? They were super cheap, like the HD-DVD add on for the XBOX 360. A crap load of HD movies for cheap is a no brainer to me. I paid $40 for 40 movies and I am super happy about it. This entry was posted on January 25, 2013 by catfishman. It was filed under Uncategorized and was tagged with bargain, beta, blu-ray, collection, deal, ebay, films, fun, hd-dvd, hi def, high definition, movies, selection, vhs, xbox 360.